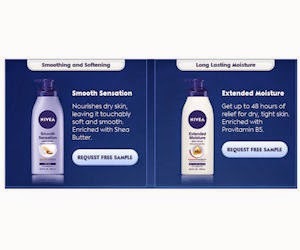 411 Freebies And More: Free Sample of Nivea Smooth Sensation or Extended Moisture Lotion! Free Sample of Nivea Smooth Sensation or Extended Moisture Lotion! Request a FREE sample of Nivea Smooth Sensation or Extended Moisture body lotion! Like them and watch the short video to access the free sample form. NOTE: You MUST watch the video to fill in the form!